Halcones Rojos have clinched the LNBP title. 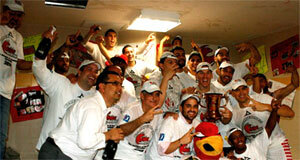 They overcame Pioneros in a dramatic seventh game of the title series to celebrate the trophy. Halcones Rojos regained the title they won back in 2012. The hosts trailed by 2 points after three quarters before their 18-12 charge, which allowed them to win the game. Worth to mention a great performance of American-Puerto Rican forward Renaldo Balkman (201-84, college: S.Carolina) who helped to win the game recording 18 points and 6 rebounds. International point guard Brody Angley (180-86, college: Santa Clara) contributed with 12 points, 5 rebounds and 6 assists (made all of his seven free throws) for the winners. Panamanian power forward Jose Lloreda (203-80, college: LSU, agency: Paris Global Sports) answered with a double-double by scoring 15 points and 12 rebounds and the former international forward Hector Hernandez (206-85, college: Fresno St.) added 13 points and 11 rebounds in the effort for Pioneros.